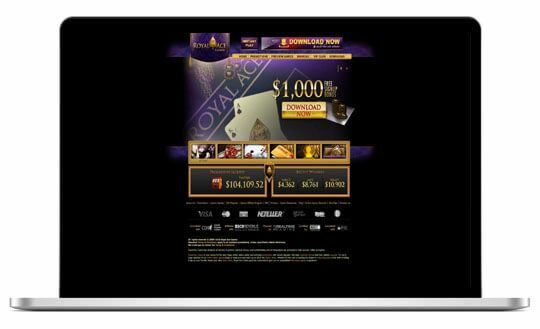 Royal Ace Casino provides Australian players with the royal treatment at their leading online casino. The casino combines the luxury of a land-based casino with the ease of online gambling. It prides itself on ensuring a reliable, safe and secure gaming environment for its players. Australian gamblers can also look forward to the latest in online casino gaming and technology, as well as exciting promotions and VIP programmes. Let’s take a closer look at each one of these aspects at Royal Ace Casino. Gambling online can be a bit scary at first which is why finding a licensed and legal casino should always be a top priority for every Aussie gambler. Royal Ace Casino is licensed and certified by Gaming Labs who conducts regular testing of the Casino’s software, hardware and practices. Australian players will have peace of mind knowing that all of their online gambling activities, transactions, and personal information is secured and encrypted with a 128-bit SSL security system. These security placements ensure the utmost privacy for each player at Royal Ace Casino. The quality and assortment of games available at any online casino is an extremely important aspect. Which is why Royal Ace is a great choice for Aussie gamblers looking for a selection of online casino games. Not only does the online casino of sought-after table games such as Blackjack, Roulette, and Poker but a range of online pokies as well. Over 100 pokies including popular titles such as Witch’s Brew, Panda Magic, Enchanted Forest, Pharaoh’s Gold and Nova 7s. Australian players can look forward to an exciting range of bonuses and rewards at Royal Ace Casino. The casino offers a 100% match deposit on whatever amount you deposit as well as redeemable coupons. Along with the welcome bonus, the casino offers a no deposit bonus. Royal Ace Casino players will have a chance to become a part of the VIP Program where they will be treated to special bonus and promotional offers. 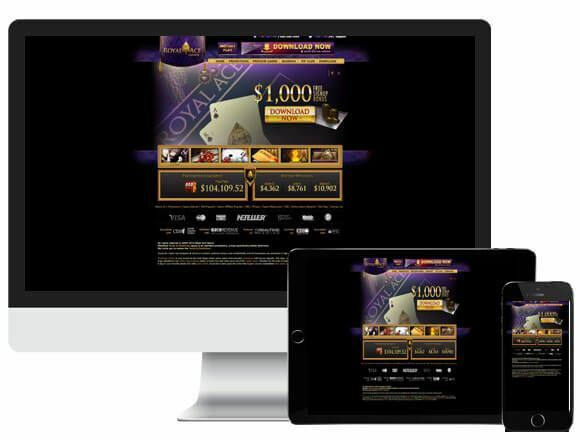 The Royal Ace Casino VIP Program places players on a level system. The more you wager, the more points you will receive and the higher up the level chain you will go, with level five being the highest. Each level comes with specific perks such as monthly insurance, specialized gifts, and complementary points. Monday Happy Hour – Earn a 50% extra on your bonus between 5 pm and 7 pm. Twofer Tuesdays – Use the redeemable code and deposit $50 or more to receive a 200% no rules bonus. 3× Wednesday Triple Threat – Receive a $100 free chip for making deposits on Monday, Tuesday and Wednesday. Thursday Thriller – Receive $160 for every $50 you deposit on Thursday. Friday Freebie – Deposit $50 or more and you will automatically be entered in the weekly $5,000 PayDirt Slot Tournament. Saturday Spin O Rama – Receive a 200% slots bonus plus 50 spins when you use the redeemable code on the either the Achilles, Voodoo or Wizards pokies. Sunday with a Cherry on Top – If you have made a real money deposit during the week you will receive a bonus chip up to $125. Royal Ace Casino has a range of safe and secure deposit and withdrawal methods for Australian players. The most popular withdrawal methods include; Neteller, Bank Wire and Bank Checks, while the most popular deposit methods include Visa and Neteller. While we have covered most of the basics here are a few extra bits we think all Aussie players should know about. Royal Ace Casino offers a 24/7 live chat support. The wagering requirement is 30 × on normal games and 60 × on table games and Video Poker. The maximum withdrawal amount depends on the amount deposited. 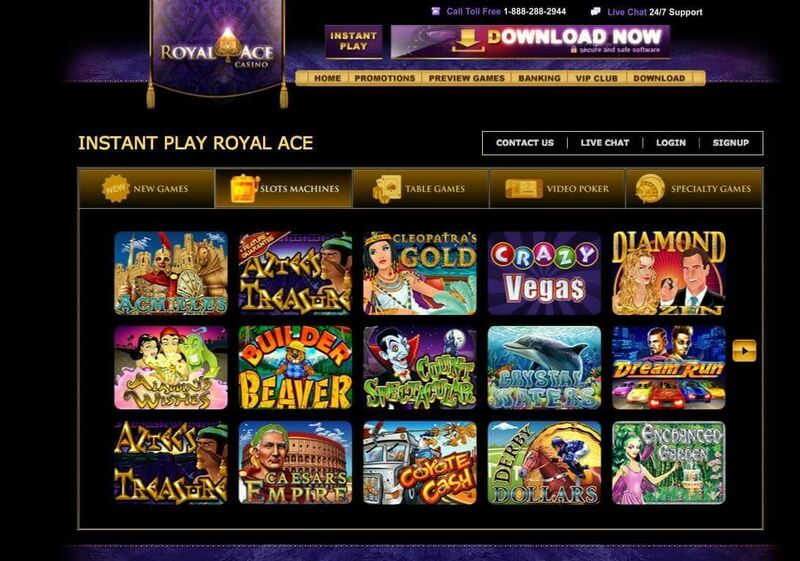 Royal Ace Casino is a reliable, user-friendly online casino that offers everything an Australian gambler needs. Great games, trustworthy software, regular bonus and promotional offers and safe banking options, Royal Ace Casino fits every Aussie player’s choice, skill and bankroll.